If you’re running a small business, you can’t afford to be complacent when it comes to securing your valuable assets whether they include customer information, confidential documentation or equipment. So, it makes sense to get a good intrusion detection system in place to safeguard your business interests. Even so, it would be untrue to say that all intrusion alarm systems were created equal. The truth of the matter is that you need to understand what goes into creating a thief-deterring security alarm system in order to get the best value for your hard-earned dollar. There are many things that go into designing a security system. These are some things you’ll want to do and consider when designing the best security system for your small business. As you might imagine, there are a wide array of intrusion alarm systems on the market, but the type of solution you ultimately choose should be based on the sort of small business that you operate. That’s why it’s critical that you have the service provider conduct an on-site survey to determine your specific needs prior to letting you know your options. As a small business owner, it’s important to know how you will be connected to the system. There are many different ways to monitor your security system, as we’ve outlined in previous posts, and these can be set up as active or passive forms.. The best way to securely monitor your system is through “dual path” communications – two forms of alarm communications out of your business to the monitoring company. This way, if one method of communication is defeated (like a burglar cutting a phone line there is a second one to send alarm signals to the security monitoring company. Your intrusion alarm systems should provide you with the option to monitor not only doors used to enter and exit your facility, but also any windows or other possible entry points that criminals might take advantage of. This can include the use of motion sensors, glass break sensors, beams and other types of devices which can detect intrusion into your business. Perimeter detection can provide a high level of security, however there may be sensitive areas within the business that you may want to consider securing as well. Being able to see alarms captured by the system and get real-time alerts on your Smartphone, tablet or other mobile device will be more useful to you than only being able to access this information via a monitoring station. You’ll also be better able to quickly assess potential problems, and make decisions more quickly if you have ready access to images. You should always want a professional monitoring your system, however the ability to access your system via your phone through an app like Alarm.com is very helpful. Services like Alarm.com used with a professional monitoring system can provide a lot of useful information about not only the security of your business, but how your business is being run. These systems also allow you to arm and disarm the system remotely, provide alerts due to abnormal activity and add and remove users remotely. Access codes are a critical part of a system because they will make it easier for you or your workers to set the alarm monitoring system or disarm the system to deactivate the alarm. It’s a good idea to ensure that each employee gets a unique pass code to keep track of who did what and when they did it. 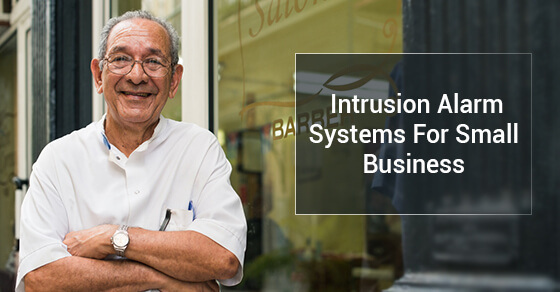 Every small business needs an intrusion alarm system to protect their business interests. Don’t leave things up to chance or blind luck — take proactive measures to ward off criminals and protect your reputation among your clients. You’ll definitely be glad you did.